Back on Sunday I wrote about how '..The way clubs treat the Away Fans initiative is symbolic of what they think of their fans' so I was blown away yesterday when Swansea announced their True to 22 scheme. I'd argued previously that although Swansea were one of the clubs putting the most effort into the Away Fans Initiative, I felt it was better spent on lower ticket prices rather than programmes, free shirts etc., I suggested that the £200k would best spent on those who may find it hardest to afford to go and without means testing everyone that'd probably be the Under 25s. What Swansea have done has gone hugely beyond that, in their statement launching the scheme they estimate the saving to be £300k but personally I think it'll be closer to £500k. The figures are a bit back of a fag packet but Swansea's figures estimate someone going to every away game will save £250, not everybody will end up buying tickets via the Jack Army subsidy but I think a huge amount will, especially for the bigger (and usually more expensive) games. Last year's Chelsea allocation was 2,200, I've seen the odd post mentioning it may be 3k this year. If we take the lower figure that could be £60k subsidy in one game with similar if not more for Man Utd Away. Clubs are prohibited from charging more for away fans than the equivalent seats for home fans (Newcastle have got fined for this in the past) so teams can't just whack up the price knowing Swansea will pay the difference, but it may be that after finishing 8th and being in their 5th season in the Premier League there may be fewer Category C type fixtures such as the £25 v Arsenal. Ultimately whether it's £300k or £500k it's still relatively small beer to the sums clubs are receiving from TV etc., but is a hugely symbolic step, time will tell if the Swans are swimming against the tide or are able to force the hand of a few other clubs as well. While you'd have too be mad to criticise the scheme there will be some consequences of it. The system is being changed slightly so Jack Army members who are season ticket holders can still buy in the second week of sale (which seems fair enough), what they haven't said is if the 30% of any allocation that was kept back previously for the 2nd week will still be happening. I'm assuming so or otherwise the full allocation could well be gone in the first week. Even if the 30% are held back then that means for Chelsea for example there could be 660 tickets available for non-ST holders which could end up going in minutes (maybe I'm over-hyping things but £22 for first game of the season at the title holders could go quickly, even if it's live on TV and a 5.30pm kick off). 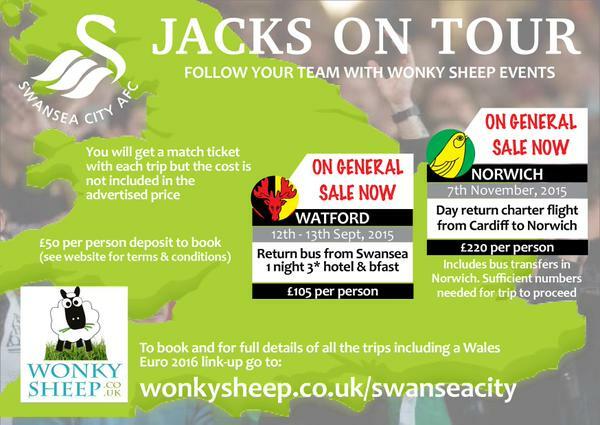 It's a bit of an extreme scenario but the main question is what happens if 3,000 Jack Army season ticket holders want to go to Watford but there's only 2,000 tickets? When the ticket office (virtual and real) open at 10am one Monday morning, who is at the front of the queue, do Wonky Sheep get priority or already have a number of tickets allocated to those who meet the ticketing criteria or do Wonky Sheep customers risk the ultimate nightmare of a weekend in Watford without even getting to watch football?